In case you don’t know, recently one of the popular web app service Buffer introduces the new feature for Google+ users, with this new feature you will schedule all you posts on your Google+ Page. If you are the regular user of buffer app and using the same web application to Schedule twitter tweets, now you can do the same on your Google+ pages. In past, we mention so many other tools which allows you to schedule twitter post and Do Share Extension for Google Plus posts. Why to use Schedule posts feature, sometime when you are not available on the internet and want to share some important message on your Google+ page, at that time you will use Buffer Google+ schedule post feature. All you have to schedule your message at a time of your choice, and the application will post your message at the mention time on your Google+ page. Its easy to schedule any update that you would be able to post on your Google+ page. And today we are going to tell you how to do that on Google+ with Buffer app. From here click on the Google+ “Connect a page” red button and login with your Google ID and password to authorize the app to access your account. To do this hit the “Accept” button form the page. On the next page you will see the list of the pages that you have with Google+. From here select the page which you want to configure with Buffer App. Selct the page to folow the next step and accept all of Google’s terms to start publishing to your Google+ page. Once the google+ page is connected with your Buffer app account, you will your Google+ page account on the buffer application sidebar. Now you’re all set to start using Buffer to schedule and publish to Google+. Simply untick or tick the avatar to choose posting with it. One of the easiest method to to schedule all you Google=page post on your timeline. 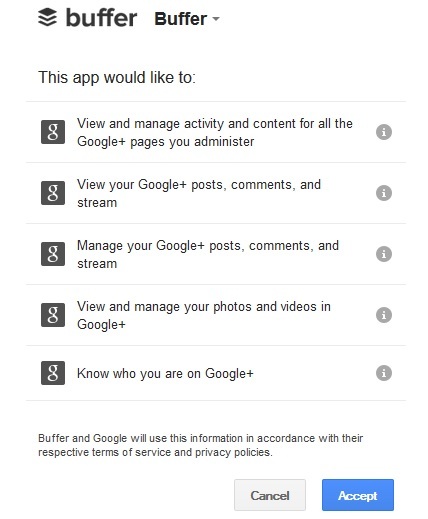 You have to must try this application once to enjoy the other benefits of the buffer application.